IT speaks volumes for his class and character when you learn that 14 of Dissident’s 21 starts were at Gr.1 level. To his credit, he prevailed in five of those Gr.1 events and was a narrow second in a further two. A son of Golden Slipper winner Sebring, he will cover his first mares at Newgate Farm, Aberdeen this spring on $38,500. Precocious enough to win a Listed event over 1000m at two on debut in the January of his juvenile season and durable enough to bow out a winner in the All-Aged Stakes-Gr.1 (1400m) in April, Dissident won seven races and more that $2m in the care of trainer Peter Moody, placed second five times and was three times third, giving him 15 “first three” placings in the best company. A $210,000 Magic Millions purchase by his trainer, he initially raced for a big syndicate of owners before being sold to China Horse Club, Newgate Farm and partners. He has a super book in his first season with the “house full” sign going up for him and other Newgate new boys Wandjina and Deep Field in early May. Given his race record and good looks it’s hardly surprising the handsome bay, who stands 16.1 hands, is proving popular and pedigree enthusiasts will be pleased to discover he is yet another superb performer descending from the 1897 English 1000 Guineas winner Chelandry (family 1n), his 12th dam. The next link in this chain is her daughter Popinjay (St Fruisquin), dam of a great Australian sire Magpie (Dark Ronald), a horse who won stakes races in England (and was a head second to Gay Crusader in the 2000 Guineas) and Australia before embarking on a successful stud career here for Percy Miller at Kia-Ora Stud where he got the likes of Windbag (sire of Chatham), Amounis and Talking and the dam of Shannon. He was Champion Sire in 1928-29 and a multiple champion sire of broodmares. Popinjay’s half-sister Chersonese (Cyglad) produced a multiple Champion Australian Sire Heroic, while Popinjay’s daughter Popingoal, a sister to Magpie, left stakes winners, Book Law (St Leger), Pogram (English Oaks), Splendid Jay (Yorkshire Oaks), Writ (Craven Stakes), Field Trial (King Edward VII Stakes) and Miss Gadabout (Cheveley Park Stakes) as well as Fair Cop (Fairway), ninth dam of Dissident. Chelandry’s influential descendants are legion and include Never Say Die and Ocean Swell (both winners of the English Derby), Sky High and his brother Skyline, Melbourne Cup winners Baystone and Just a Dash, Neil Gow, Zoffany, Mi Preferido, Tommy Lee, Genuine Risk (the last two, Kentucky Derby winners), Forty Niner, Shadeed, Dignitas and Anabaa (USA), whose daughter, stakes placed Diana’s Secret is the dam of Dissident. Dissident’s fifth dam Hellespont (GB) brought this branch of the family to Australasia and the daughter of Darius (Dante) is closely related to Ascot Stakes, Chester Cup and Goodwood Cup winner Trelawney. Hellespont’s stakeswinning daughter Helen of Troy (Sovereign Edition (IRE)) left the stakes winner and producer Calera (Zamazaan (FR)), in turn dam of Australasian Oaks and Caulfield Cup winner Imposera (Imposing). Helen of Troy’s unplaced sister Early Edition is Dissident’s fourth dam. She left five winners including South African Gr.1 winner World News and Australian Gr.3 winner Palace Gossip (in The Purple (FR)), who is Dissident’s third dam. Palace Gossip was good enough to win six races from 1400m-2000m including a trio of Gr.3 events, notably the Frances Tressady Stakes. She was also runner-up in the Storm Queen Stakes-Gr.2 and fourth in the VRC Oaks-Gr.1. Her four winners include Mountebank (Habituate), 11 wins including the Christmas Cup-LR, while descendants of her unraced daughter Crawfie include the Gr.3 winner and Queensland Oaks-Gr.1 runner-up Vietnam (Admiralty (USA)) and stakes placed Frill Seeking (Sebring). Palace Gossip’s daughter Palace Scandal (Western Symphony (USA)) won over 1400m and produced six winners including the stakes placed Heir Affair (Salieri (USA)), runner-up in the Peter Pan Stakes-Gr.2 and the Hill Smith Stakes-LR runner-up Diana’s Secret (Anabaa), the dam of Dissident. Dissident’s sire, the 2007-08 Champion Two Year-Old Colt of Australia Sebring, won five of his six starts at two including the Golden Slipper-Gr.1 and AJC Sires’ Produce-Gr.1 and was also runner-up to Samantha Miss in the Champagne Stakes-Gr.1. He began stud duties in 2009 and Dissident is one of two standout colts from his first crop, the other being the multiple Gr.1 winner Criterion (Bite The Bullet (USA)), successful in the Queen Elizabeth Stakes, ATC Derby and Rosehill Guineas at the elite level and not far away when fifth in the Prince of Wales’s at Royal Ascot in June. Sebring is by Vinery’s first rate sire More Than Ready (USA) (Southern Halo-Woodman’s Girl by Woodman (USA)), a Gr.1-winning sprinter in the US whose major win came in the King’s Bishop Stakes-Gr.1 (7f). He won five of his seven starts at two, starting with a maiden at 4.5f, and was set for the Kentucky Derby at three, when he was runner-up in the Blue Grass-Gr.1, Dwyer-Gr.2 and Louisiana Derby-Gr.2, before running fourth in the Derby, where the 10f trip was out of his comfort zone, before reverting to sprinting when he was also runner-up in the Vosburgh-Gr.1 and third in the Futurity Stakes-Gr.1. His dam is by major Mr. Prospector son Woodman, a very successful shuttle sire from the family of wonderful broodmare La Trioenne, who is also the sixth dam of More Than Ready. 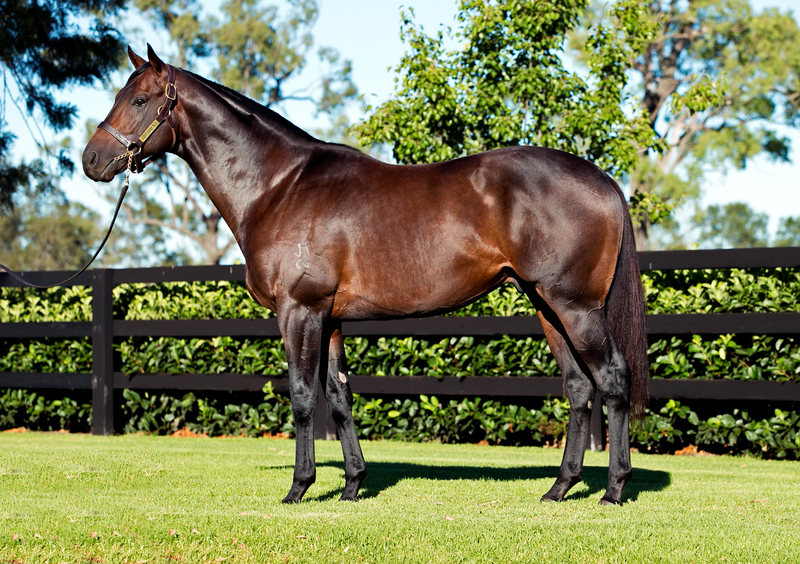 A Champion Sire of Juveniles in Australia and the US, More Than Ready’s major southern performers among more than 130 stakes winners include More Joyous (Sunday Silence; second dam by Danehill, inbred to Halo 3mx3m), 21 wins and $4.5m, Samaready (Secret Savings), Dreamaway (Danehill), More Than Sacred (Danehill), Perfectly Ready (Danehill), Carry on Cutie (Conquistarose), Phelan Ready (Blevic), Benicio (Danehill) and Gimmethegreenlight (Canny Lad). His northern runners are led by shuttle newcomer Verazzano (USA) (Giant’s Causeway), a dual Gr.1 winner who will stand at Coolmore in 2015, Regally Ready (King of Kings), Room Service (Old Trieste) and Buster’s Ready (Honour and Glory). The nick with Danehill has been a very lucrative one for More Than Ready, and Sebring is another example of this cross as his dam Purespeed is by a Danehill Golden Slipper winner in Flying Spur. Flying Spur’s dam is the Mr. Prospector mare Rolls (USA) (also second dam of Encosta de Lago), giving Sebring a 4mx4f cross of Mr. Prospector. He also has Northern Dancer 4fx5m,6f. His dam is a half-sister to Gr.2 winner Surtee (by the Roberto son Memento (USA)) and his second dam is by another Golden Slipper winner in Luskin Star (Kaoru Star) and he hails from a female line whose descendants also include Golden Slipper winner and sire Baguette, a three-quarter brother to his fourth dam Far Vista, whose dam Nippy Vista (Port Vista) is a half-sister to Baguette’s dam Dark Jewel (Star Kingdom). Sebring’s other stakes winners include Bring Me The Maid (by the Danzig son and La Trioenne family member Belong to Me; Danzig 5mx3m), Believe Yourself (Encosta de Lago, has Rolls 4mx4f), Clifton Red (Encosta de Lago; another with Rolls 4mx4f), Bring a Ring (Hennessy), Interspeed (Tale of the Cat), Bring Something (Naturalism), Pressing (Choisir, Danehill 4mx4m), Kiss A Rose (Redoute’s Choice; Danehill 4mx3m), Scratchy Bottom (Danehill; 4mx2m Danehill), Thurlow (King’s Chapel) and Typing (Zabeel). As he is already carrying a 5mx3m cross of Danzig via his sons Danehill and Anabaa among five lines of Northern Dancer 5f,6m,7fx4m,5m, plus additional lines of his dam Natalama and her half-sister Cosmah (dam of Halo), breeders might have to be a it more creative in their choice of mates for Dissident. Daughters of Encosta de Lago and his son Northern Meteor and those from the line of champion sire Redoute’s Choice (a Danehill son whose dam sire Canny Lad has worked with Sebring and More Than Ready) should suit (ditto Choisir), as should daughters of General Nediym, while mares carrying Don’t Say Halo (a Halo son from the La Trioenne family) or others strong in La Troienne could also work. The Storm Cat, Sir Tristram and Sadler’s Wells lines have also worked with More Than Ready and Sebring and are worth examining for Dissident, providing the rest of the mare’s pedigree is compatible. Anabaa daughters have also produced Gr.1 winners by Mossman (Buffering), Motivator (Treve), Galileo (Lush Lashes), Verglas (Silver Frost), Testa Rossa (Rostova), Authorized (Hartnell), Giant’s Causeway (Dalkala) and Haradasun (Harry’s Son) and other stakes winners by Redoute’s Choice, Galileo, Manhattan Café, Encosta de Lago, Secret Savings, Slickly, Footstepsinthesand, Pivotal, Denman, Starcraft and Xaar, so this information is worth considering when contemplating mares to send to Dissident. of Life. He resumed on August 10 for a second in the Listed Rosebud at Randwick behind Eurozone, was then a narrow second in the Run to the Rose-Gr.3 at Rosehill behind Pensiero and then split Zoustar and Bull Point when second in the Golden Rose-Gr.1 on September 14. He was then sixth against the older milers in the George Main-Gr.1 to Streama and fourth in the Caulfield Guineas-Gr.1 to Long John before another spell. Back in action on February 15, 2014, he was runner-up to El Roca in the Eskimo Prince Stakes-LR and then claimed the Hobartville Stakes-Gr.2 (1400m) from Atlante and Savvy Nature before relegating El Roca (favourite) and Eurozone into the minors when claiming his first Gr.1 in the Randwick Guineas-Gr.1 (1600m in 1:36.33), thanks to a great ride by veteran Jimmy Cassidy who got the colt up by a short head to claim his 101st Gr.1. Dissident showed great heart as El Roco shifted in and bumped him with 100m to go. “My bloke wasn’t going to lay down and it was a good effort to fight back, he’s starting to turn from a boy into a man, which is great,” Cassidy said. A sixth in the Rosehill Guineas behind Criterion and a mid-field run in the Doncaster behind Sacred Falls ended the colt’s campaign and he was sent for another break. He resumed in the new season with a superb win in the Memsie Stakes-Gr.1 (1400m in 1:22.72) at Caulfield on August 30 beating flying filly and early leader Sweet Idea by 2.25 lengths and with Puissance de Lune third. Dissident followed the leaders and then unleashed a powerful sprint when jockey Ben Melham gave the four year-old his head. Dissident made it in back-to-back Gr.1 wins by claiming the VRC Makybe Diva Stakes-Gr.1 (1600m in 1:36.29) on September 13, beating Fawkner and Puissance de Lune and was then narrowly beaten by Trust in a Gust in the Sir Rupert Clarke Stakes-Gr.1 (Bull Point third). He was spelled after a sixth in the Caulfield Stakes-Gr.1 (2000m) on October 11.